This weekend’s NASCAR Nationwide Series race at Chicagoland Speedway in Joliet, IL. 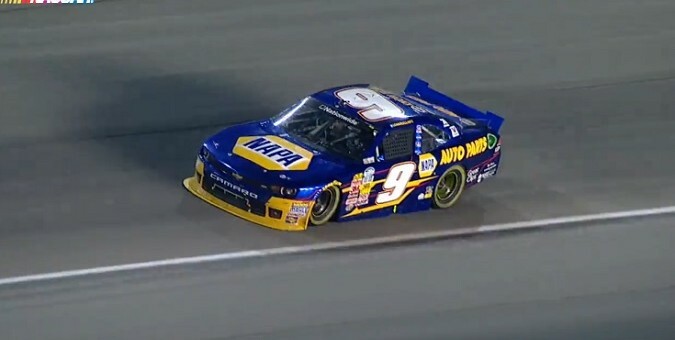 saw Chase Elliott hold off a determined Trevor Bayne late in the race, putting another win under the belt of Team Chevy. The win is the third of the season for 18-year old Elliott and bumped him into the Nationwide Series championship points lead, moving JR Motorsports teammate Regan Smith into second. Behind Elliott in his No. 9 JR Motorsports Camaro was the No. 6 Roush Fenway Racing Ford of Bayne, who crossed the line just 1.7 seconds after him. Meanwhile Sprint Cup drivers Kyle Larson and Kasey Kahne butted heads for third place during the closing laps of the race. Larson and his No. 42 Turner Scott Motorsports Chevrolet came out on top, with Kahne’s No. 5 JR Motorsports Chevrolet finishing fourth. Ty Dillon crossed the finish line in fifth in his No. 3 Richard Childress Racing Chevrolet, putting four Chevys in the top five. Elliott moved into first position early in the race during lap 25, when he passed pole sitter Brian Scott in the No. 2 Richard Childress Racing Chevy. He quickly widened his lead by 8.2 seconds, but his hard work was all for none after a yellow flag was put out for debris on the track on lap 70. Upon the restart, Elliott lost his first place position to the No. 22 Team Penske Ford of Ryan Blaney. Larson took the lead from Blaney on a restart on lap 127 and led the race until he had contact with wall on lap 140, allowing Elliott to reclaim first position. The next race on the NASCAR Nationwide Series schedule is the Lilly Diabetes 250 to be held at Indianapolis Motor Speedway on July 26.